Wahl Eversharp Pacemaker fountain from 1938-41. Lever filler in the black color with gold plated trim. Fine Eversharp Manifold #25 14k nib. Excellent + condition, fully restored and working well. Type Lever filling vintage fountain pen, restored and working well. 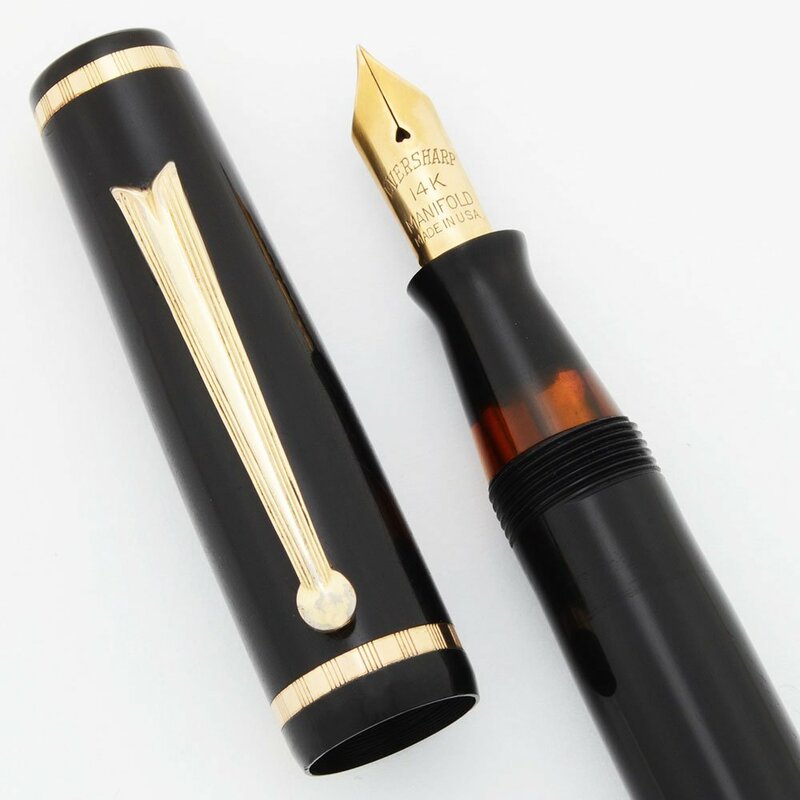 Color Black pen with gold filled trim. The cap has two narrow bands with fine lines and the clip has similarly spaced longer lines etched into it. The pen has a viewing window. 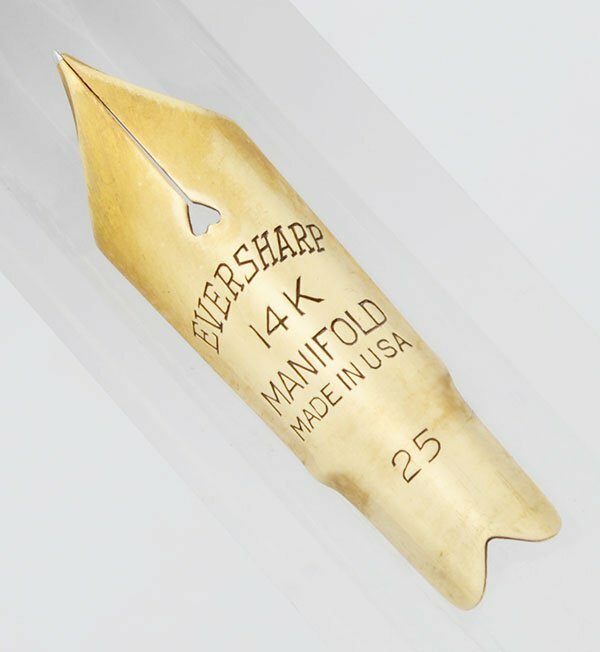 Nib FINE Eversharp Manifold #25 14k nib. The nib writes smoothly and has nice tipping material. 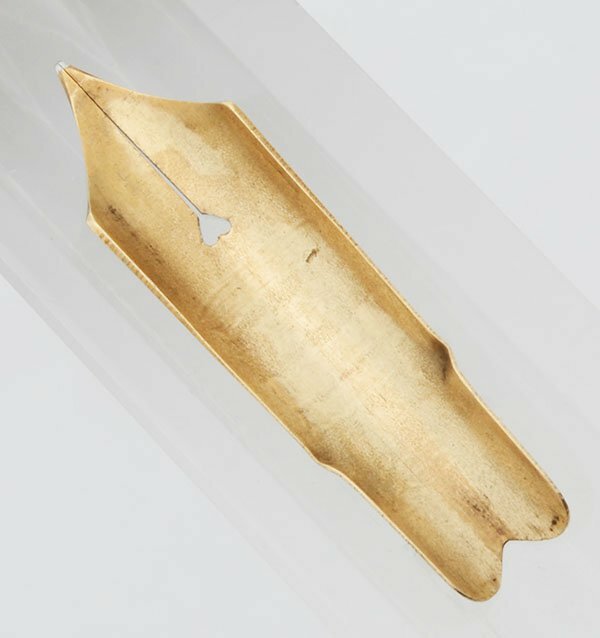 The nib has an unusual shape and we photographed it unseated from the pen. This nib has interesting angles as it enters the section, and we wanted to make sure this had not been the result of being forced into a too-small section .... these seem to have been done by Wahl. Condition Excellent condition. No cracks. The trim patterning is delineated and the barrel imprint is crisp. The lever is brassed and the cap bands have dings. There are a few marks throughout. The pen has been fully restored and it's working very well.